222 pages | 1 B/W Illus. This book investigates the English translations and adaptations of the sixteenth century classic Chinese novel Jin Ping Mei. Acclaimed the ‘No.1 Marvellous Book’ of the Ming dynasty, Jin Ping Mei was banned soon after its appearance, due to the inclusion of graphically explicit sexual descriptions. So far there have been more than a dozen English adaptations and translations of the novel. 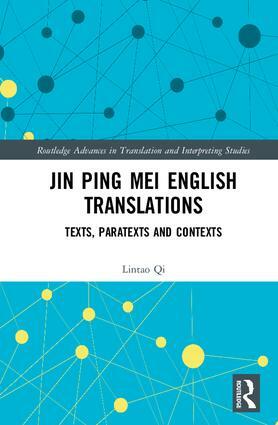 Working within the framework of descriptive translation studies, this book provides a translational history of the English versions of Jin Ping Mei, supported by various paratexts, including book covers, reviews, and archival materials. It also conducts textual comparisons to uncover the translation norms at work in the only two complete renditions, namely The Golden Lotus by Clement Egerton and The Plum in the Golden Vase by David Roy, respectively. The notions of agency, habitus and capital are introduced for the examination of the transference of linguistic, literary and cultural aspects of the two translations. The book represents the first systematic research effort on the English Translations of Jin Ping Mei. Given its pioneering status and interdisciplinary nature, the data, structure and findings of this book will potentially enrich the fields of Translation Studies, Comparative Literature, Chinese Studies, Cultural Studies and Book History. Lintao Qi is a Tutor, Lecturer, Coordinator and Supervisor of the Master’s Program of Translation and Interpreting, School of Languages, Literatures, Cultures and Linguistics, Monash University, Australia.